The European bison, the continent's largest wild land mammal, used to roam across Europe until it was hunted to extinction in the wild in 1927. Last weekend (17 May 2014), however, 17 European bison were brought into the Tarcu Mountain Reserve in Romania's Southern Carpathians, with a further 10 more due later this summer, as part of a complex rewilding operation. 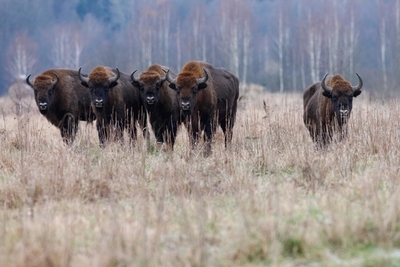 Wildlife Worldwide, has been invited by Rewilding Europe and its partner WWF Romania to be the only UK tour operator to offer trips to witness the further reintroduction of bison between mid-June and the end of August. Wildlife Worldwide's brand new tailor-made 5-day adventure will involve learning about the bison and their rewilding from the people who spearheaded the operation and will feature other fascinating wildlife in the remote TarcuMountains. The initiative is particularly exciting for the local community with bison more rare in the wild than the black rhino in Africa, as well as being an important part of Romania's natural heritage, through legends, myths and place names. Extinct from the area for over 250 years, this new bison population has been brought in from several corners of Europe so that within 10 years there will be some 500 European bison living in total freedom in an area spanning 59,000 hectares of remote mountains, meadows and valleys. Once released into the wild, the bison will not be fed or handled, so that they will become a full part of their natural ecosystem. Natural grazing by large herbivores is one of the key ecological factors in the landscapes upon which a large part of Europe's biodiversity is dependent. It will also stimulate a comeback of other wildlife species such as red deer, roe deer, chamois and the carnivores connected to them. Having first been released into an acclimatisation zone, the bison will then progress to a larger zone to rewild; in other words learn the skills necessary for their survival and form a social herd structure. In early September 2014 the first bison will finally be released into the wild and become the first to roam the TarcuMountains since the 18th century. By becoming a tourism attraction, the bison's introduction will help create business opportunities and employment for the local community. Indeed, some locals have already been trained as rangers and bison guides. To welcome the project (on Saturday 17 May), the village priest blessed the animals and two local children opened the door of the truck used to transport them, while later the entire village celebrated their arrival at a massive evening 'Bison party'. experiencing the fascinating local culture and traditions of the region, unchanged for hundreds of years and still relatively untouched. Price: Wildlife Worldwide (wildlifeworldwide.com) will exclusively offer Rewilding Bison in Tarcu Mountains Reserve from £1,495 per person, including return flights London to Timisoara via Munich, four nights' full board accommodation, English-speaking guide, all transfers, guided activities and WWF-Romania evening presentations by local wildlife experts. Season: mid-June to the end of August.